January - Always an anticlimax after the Christmas break the month eased itself in without great announcement. We spent New Years Eve with the usual suspects at Nick & Val's, stayed over night and went for a damp walk in the morning before having sausage sandwiches for brunch. We can't do these late night events, drinking, talking, playing silly games without feeling completely wasted the following day. We're not as young as we used to be... talk about stating the obvious. We must apologise for the removal of the guest book facility. This was a free service that we latched onto and unfortunately the site has become unstable and is unavailable more often than not so we've abandoned it. If you wish to make comment then please email us. Broadband is amazing. How did we ever survive without it? Well I'm sure there are a lot of people out their, many of them our friends who are quite happy to live without it and some of them don't even carry a mobile phone - How do they get by? After many months of waiting we've at last managed to get broadband into the house thanks to eclipse.net and BT. Our house has the master BT socket in the loft, crazy but true. Therefore to get a connection to the computers we've installed a WiFi router in the loft and a WiFi card into each of our computers. This means that we both have broadband and our computers are also wirelessly networked via the router. We can surf the net at any time listen for emails arriving at the inbox to voice of HAL, from 2001 A Space Odyssey, one of Steve's all time favourite films but that's another story. In the first part of the month we used our Orange Wednesday 241, yes that's two for one, to go to the cinema. Because we use Orange mobile phones we try to take advantage of their two cinema tickets for the price of one as often as we can. We went to see the The Chronicles of Narnia: The Lion, the witch and the wardrobe. Steve thought the wardrobe was a bit wooden but apart from that it was brilliant. OK it was meant for children, but hey, we haven't grown up yet so that's fine. The special effects were good, acting by the children was superb, better than the Harry Potter actors and overall a great evening out - you come out believing that lions can speak and that god really exists, OK that maybe taking things too far. We were in two minds as to whether to include this as an item because it is so hum drum but... We've been very lucky with our washing machines, in fact we've only ever owned two. Admittedly for the first eight years of marriage Jane washed by hand or we went to the launderette. That aside, our first machine lasted thirteen years and our second has just started to run out of steam, not literally. It was twelve years old and there were soap powder stains appearing on clothes so it was time to spend some of our new found wealth on a new washer. Choice is never easy but in the end we decided upon a Which magazine best buy and purchased a Siemens machine - made in Germany but unfortunately bought from Comet. Buying goods is always straight forward but the nightmare begins when you try to get them delivered. Needless to say Steve managed to get his blood pressure raised when the store reneged on their commitment to let us know when it would be delivered on the Saturday. It did arrive, it's working and all is well. Another Wednesday finds us sitting in the cinema on the recommendation of the Oz criminals, Dave & Lucie, after they've told us that King Kong was even better than the Chronicles of Narnia - so it was a must see film. We prepared ourselves for the three hour onslaught with the expectation that we would both, from time to time, be catching up on some sleepless nights. No such luck. The film leads you in gently with some wonderful character building and gentle humour then the pace picks up. The last two hours fly by as you sit on the edge of the seat fighting dinosaurs and bugs the size of badgers. This is a very good, escapist film and if you haven't seen it yet make sure you do. The last weekend of the month proved to be bitterly cold but we decided to brave the icy wind and went for a walk across the fields and along the Northampton arm of the Grand Union canal. 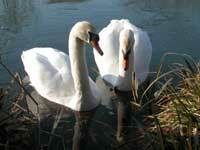 This pair of swans had found a small area of unfrozen water and were looking to be fed. Unfortunately we had not anticipated this encounter and had left the stale bread at home. Earlier in the walk we came across a dead, fully grown swan in the hedgerow. Why it died or was killed we shall never know but our thoughts went out to the swan's partner because they usually pair for life. The face of Northampton is changing rapidly and this is only the beginning. Central government has plans to open up the building of thousands of new homes in the area between Milton Keynes and Corby. This is Upton village that will consist of energy conserving houses in a small community design. The architecture is quite unique to the area - Northampton is not famous for architectural innovation and many of the interesting, historic properties in the town centre have been demolished to make way for mind-numbingly, dull buildings. It will be interesting to return to this area in ten years time to see what the inhabitants have made of it. 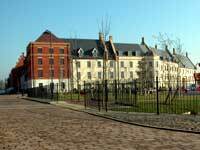 Will it have gone down market or become an elitist area where on the affluent can afford to live. Or will the affluent still be looking for sandstone properties in the Northamptonshire villages?